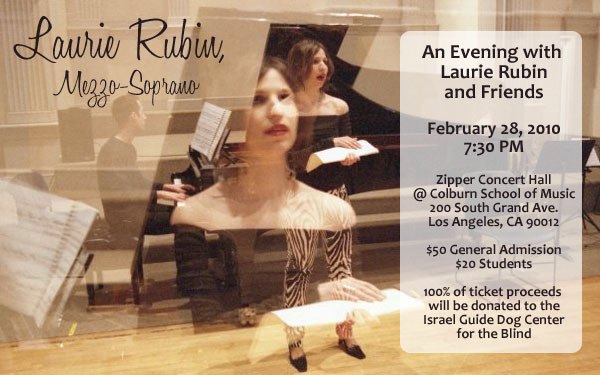 Celebrated mezzo-soprano Laurie Rubin, a native of Encino and now a full-time resident of New York City, will return home to California on February 28 to perform a program of works by Mozart, Rodrigo, Gershwin, Sondheim, Schwartz, and Sivan, among others. The evening will also feature special guest artists. Set to benefit the Israel Guide Dog Center for the Blind, the concert will be held at Zipper Concert Hall at the Colburn School of Music, and the curtain goes up at 7:30pm. Blind since birth, Ms. Rubin received high praise from The New York Times chief classical music critic Anthony Tommasini, who wrote she possesses “compelling artistry,” “communicative power,” and that her voice displays “earthy, rich and poignant qualities.” Recent career highlights include her United Kingdom solo recital debut at Wigmore Hall in London, as well as her solo recital debut at Weill Recital Hall at Carnegie Hall. Ms. Rubin has performed concerts of new music with the Chamber Music Society of Lincoln Center, and has performed numerous roles, including the lead role of Karen in The Rat Land by Gordon Beeferman with New York City Opera, Penelope in Monteverdi’s The Return of Ulysses, and the title role in Rossini’s La Cenerentola. She has recorded a CD with renowned collaborative pianists Graham Johnson and David Wilkinson on the Opera Omnia label. Tickets for this special evening with Laurie Rubin and Friends are $50 (with a special student price of $20), and are 100% tax deductible. They may be purchased online at www.brownpapertickets.com/event/93740, or by calling (800) 838-3006. Tickets will also be on sale at the door, subject to availability. Zipper Concert Hall at the Colburn School of Music is located at 200 S. Grand Avenue in downtown Los Angeles. For further concert information, please visit www.laurie-rubin.com, or call (818) 905-1421.